I feel like we’re on the edge of a technology breakthrough when it comes to robots. Robots which are actually like humans. How did I decide that? 1980s film fiction of course! Lexus have basically succeeded in building a hoverboard this year (featured in Back To The Future – released in 1985) and Terminator (released in 1984) starred a pretty convincing humanoid in the form of Arnold Schwarzenegger. So if anything, a well built robot that looks, thinks and acts like a human is in fact a year late. That readers…is logic. Ok so realistically Terminator like bots are probably not going to be seen walking the streets for quite a few years. At the moment we’re not really there at all. We’ve got robots that can kind of walk like us, but have trouble with stairs. And then there are the ones that really can’t talk like us, which we decide to use for customer service! Yep, the 1980s movie trivia waffling has segued nicely into why we are here. You’re here to figure out how to improve customer service. I’m here to tell you that it starts with having less robotic customer service. We don’t have machines imitating humans just yet; we have machines that poorly imitate humans and humans in customer service departments imitating robots (for some strange reason). Robots and automated customer service are a long way off from giving our customers the care and attention that they need. If you are using an automated system for phone, email or any other channel at the moment, there is a good chance that you’re ticking your customers off. I think everyone understands how annoying a bad automated customer service experience can be. You get the long list of support options that you have to suffer through (Press 4 to get back to the machine that greeted you when you pressed 2). You try hopelessly to talk to a real person (Press 3 for someone who’ll turn out to be another machine). And then you’ve got the situation where you just give up and try to cope with the wooden answers of the automated system – with its preloaded finite number of responses. According to research carried out by NewVoiceMedia, 40% of customers are irritated if they don’t speak to a real person immediately when phoning customer service. In all honesty, I can’t believe that number isn’t higher! It’s not just telephone conversations which customers hate having with robots either. Email, ticketing and live chat systems can be programmed with automated scripts and they can make for equally excruciating customer service exchanges. Here at The Chat Shop we don’t go in for any of that robotic customer service rubbish. We’re all about real people having real conversations. The human touch means that our agents make real connections with customers, whilst improving metrics such as customer satisfaction, conversion and lead generation. We often have customers immediately double checking that they are talking to a human on live chat, because they know the pain and anguish which comes with robotic “conversations”. And our agents reply in the most human and witty way that they can, of course. So getting rid of these painful automated systems which are a far cry from real human interactions is a step in the right direction of “How To Improve Customer Service”. Next step, make sure you aren’t replacing robots that act like humans, with humans that act like robots. Some customer service departments seem fond of forcing their customer service representatives into using prewritten scripts that ensure that they don’t sway from the “ideal” conversation. This ideal conversation is written by a customer service manager that just wants to increase the number of complaints his/her department can wade through in a day. Even if customer service agents in these departments genuinely want to help, they can’t. The humans that are forced to play robot, must play by the rules i.e. follow that annoying script. In order for you to improve customer service, your front line team need to have the power to be humans and that means the power to make decisions. Let your support agents get to know customers and have a friendly chat rather than an unfruitful, stale exchange of drivel. Sticking to a script means that support agents can’t get to the root cause of a customer’s issue, meaning that the customer has no chance of leaving satisfied. These robotic answers often result in angst for the customer too! The sorry never sounds genuine when spoken or typed from a pre-written statement. With a little bit of rope, the human agent can produce marvelous interactions and customer experiences on their own accord. The human mind is an empathetic, problem-solving agent. Humans naturally try to make connections with people and help solve their problems – that’s human nature. Corporate policies and robotic scripts shouldn’t interfere with this. Companies get this valuable gift and then, inexplicably, suppress it. If your team is forced to follow a rigid process then it’s unlikely they’re going to be able to deliver a service that makes your customer smile. 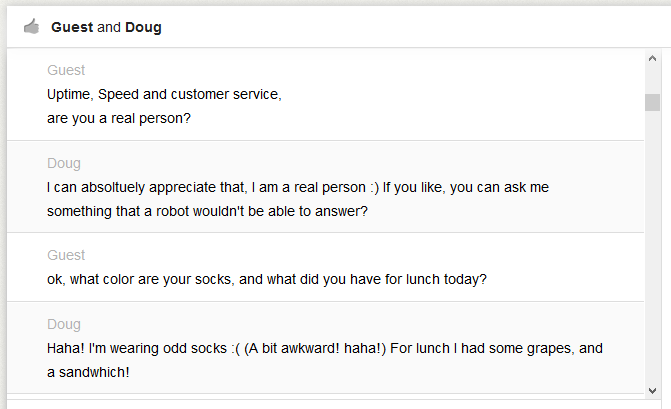 Please, for the sake of your customers, replace the robots with real people and replace scripts with real conversation. Consider how you can empower your team to really delight in any situation. Let them use a human touch rather than follow a robotic script. Let them show empathy and genuinely be there for your customers. At The Chat Shop, making real connections with customers allows us to go beyond solving problems in a friendly manner. We generate 50% more leads from existing website traffic for our clients; a human touch allows us to provide real buying recommendations and advice that customers just can’t get from website copy or a robot. We do more than just plug the gaps when customers face a problem. Discover how live chat can transform your customer experience.